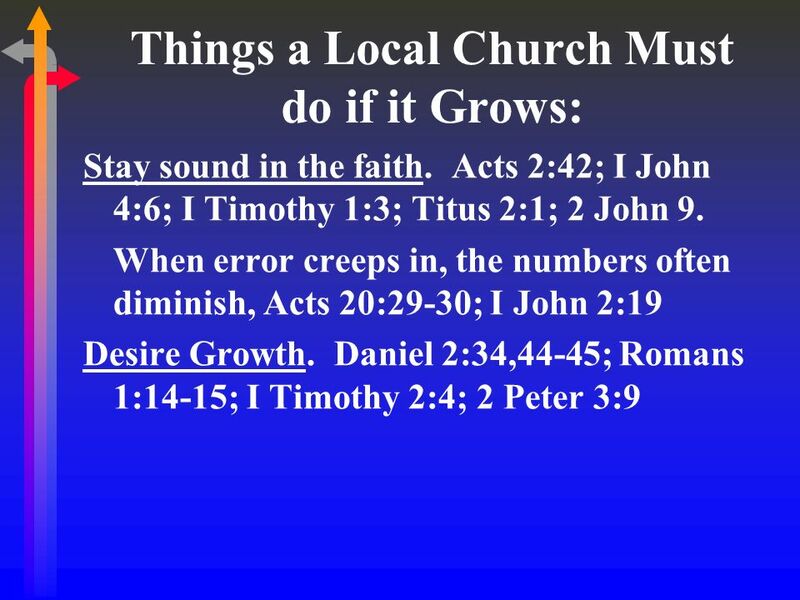 2 Three Basic Facts: Growth is Essential to the Continuity of the Church. The Lords Church in the first Century Grew. The Lords Church in the first Century Grew Rapidly. 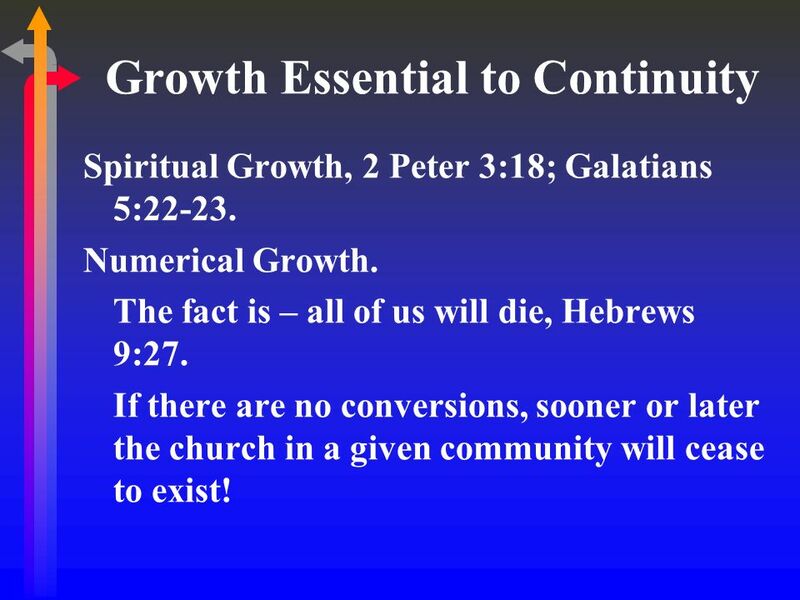 3 Growth Essential to Continuity Spiritual Growth, 2 Peter 3:18; Galatians 5:22-23. Numerical Growth. The fact is – all of us will die, Hebrews 9:27. If there are no conversions, sooner or later the church in a given community will cease to exist! 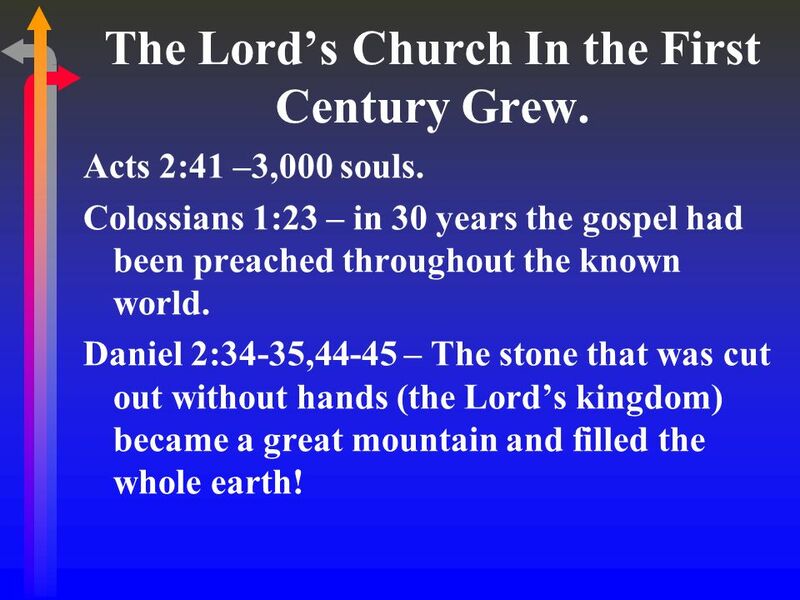 4 The Lords Church In the First Century Grew. Acts 2:41 –3,000 souls. Colossians 1:23 – in 30 years the gospel had been preached throughout the known world. Daniel 2:34-35,44-45 – The stone that was cut out without hands (the Lords kingdom) became a great mountain and filled the whole earth! 5 The 1 st Century Church Grew Rapidly! 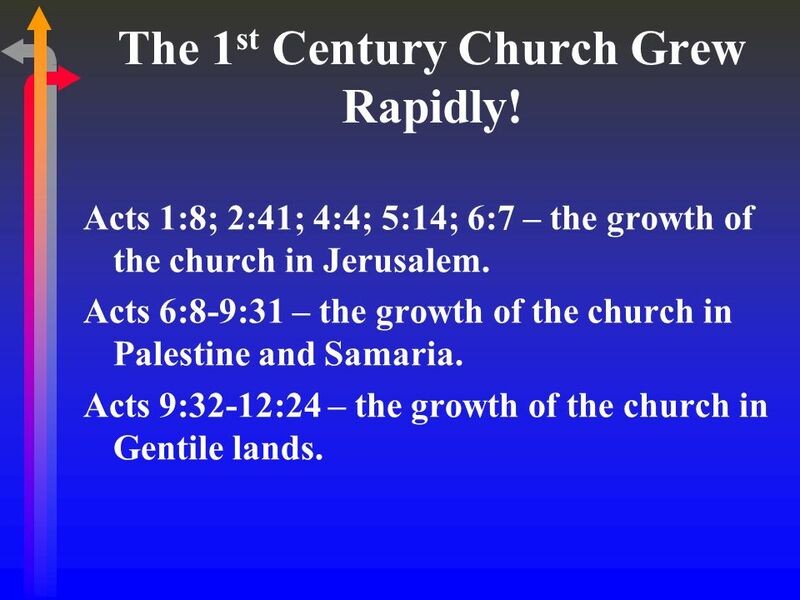 Acts 1:8; 2:41; 4:4; 5:14; 6:7 – the growth of the church in Jerusalem. Acts 6:8-9:31 – the growth of the church in Palestine and Samaria. 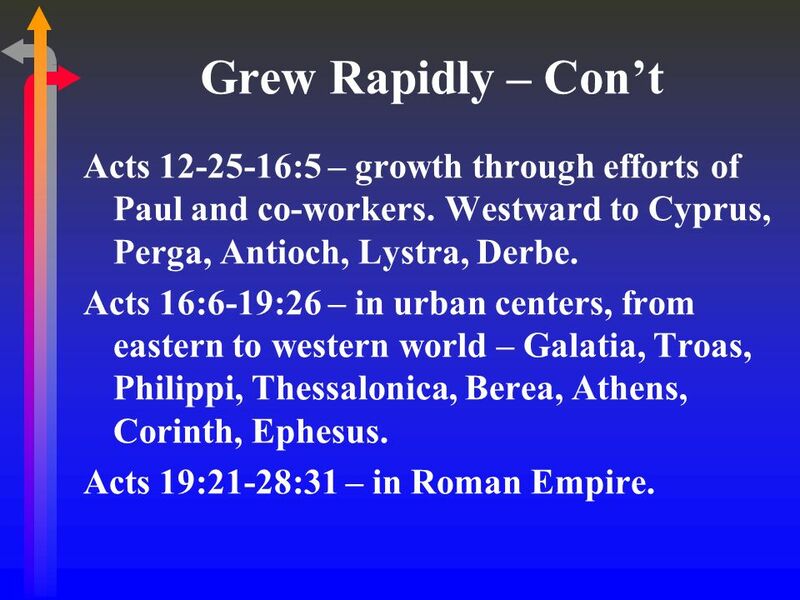 Acts 9:32-12:24 – the growth of the church in Gentile lands. 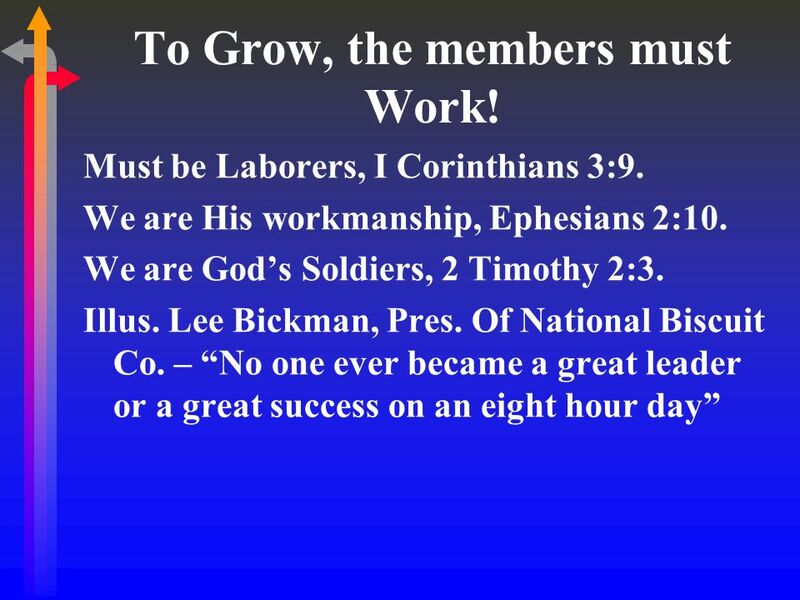 6 Grew Rapidly – Cont Acts 12-25-16:5 – growth through efforts of Paul and co-workers. Westward to Cyprus, Perga, Antioch, Lystra, Derbe. Acts 16:6-19:26 – in urban centers, from eastern to western world – Galatia, Troas, Philippi, Thessalonica, Berea, Athens, Corinth, Ephesus. Acts 19:21-28:31 – in Roman Empire. 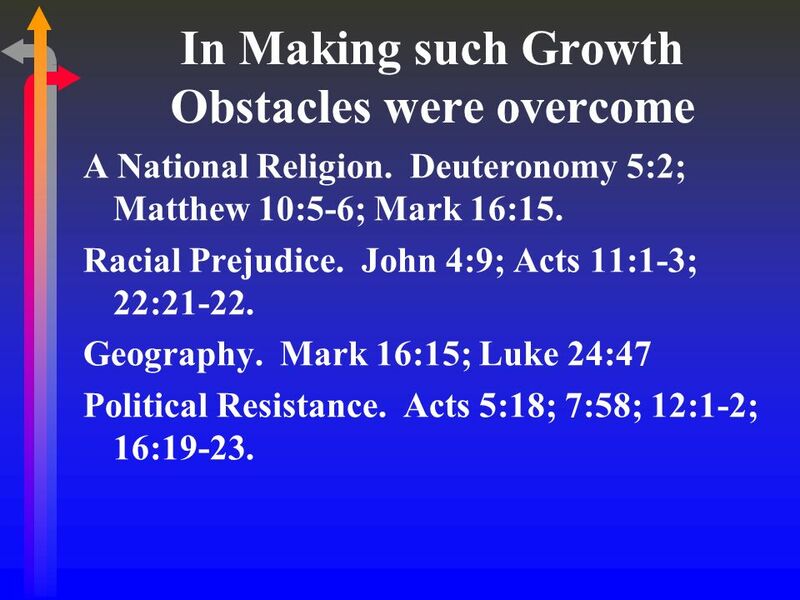 7 In Making such Growth Obstacles were overcome A National Religion. Deuteronomy 5:2; Matthew 10:5-6; Mark 16:15. Racial Prejudice. John 4:9; Acts 11:1-3; 22:21-22. Geography. Mark 16:15; Luke 24:47 Political Resistance. Acts 5:18; 7:58; 12:1-2; 16:19-23. 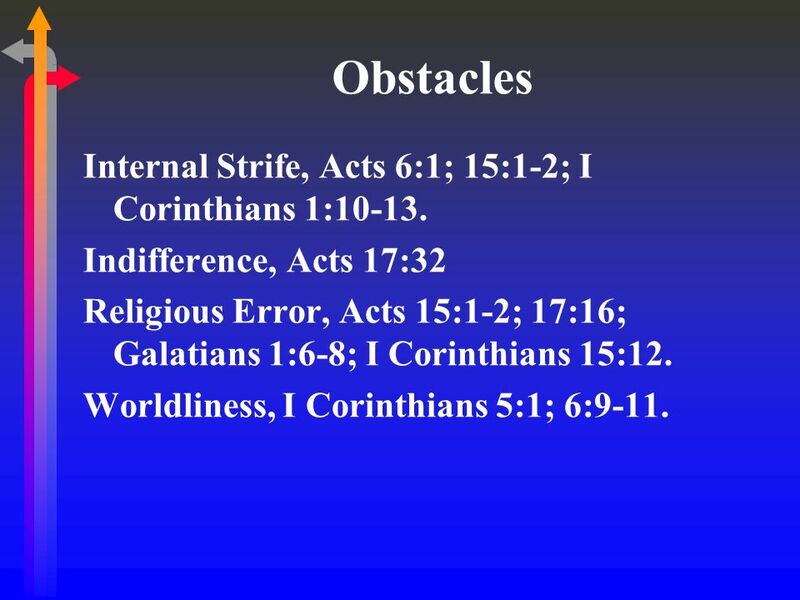 8 Obstacles Internal Strife, Acts 6:1; 15:1-2; I Corinthians 1:10-13. Indifference, Acts 17:32 Religious Error, Acts 15:1-2; 17:16; Galatians 1:6-8; I Corinthians 15:12. Worldliness, I Corinthians 5:1; 6:9-11. 10 Must Deal with Problems when they Arise. God dealt with Ananias, Acts 5:1-11. Consider Corinth, I Corinthians 1:10-13. 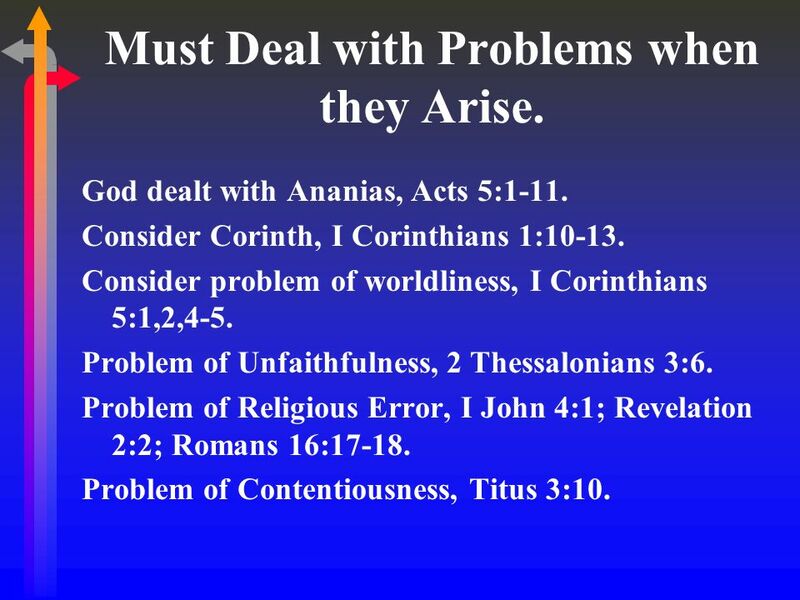 Consider problem of worldliness, I Corinthians 5:1,2,4-5. Problem of Unfaithfulness, 2 Thessalonians 3:6. Problem of Religious Error, I John 4:1; Revelation 2:2; Romans 16:17-18. Problem of Contentiousness, Titus 3:10. 13 To Grow, we must Pray! Acts 2:42; 4:31; 12:5; 13:3; 16:25; 20:36-37; 27:35; 28:15. Other Scriptures: I Thessalonians 5:17; Luke 18:1; James 5:16. 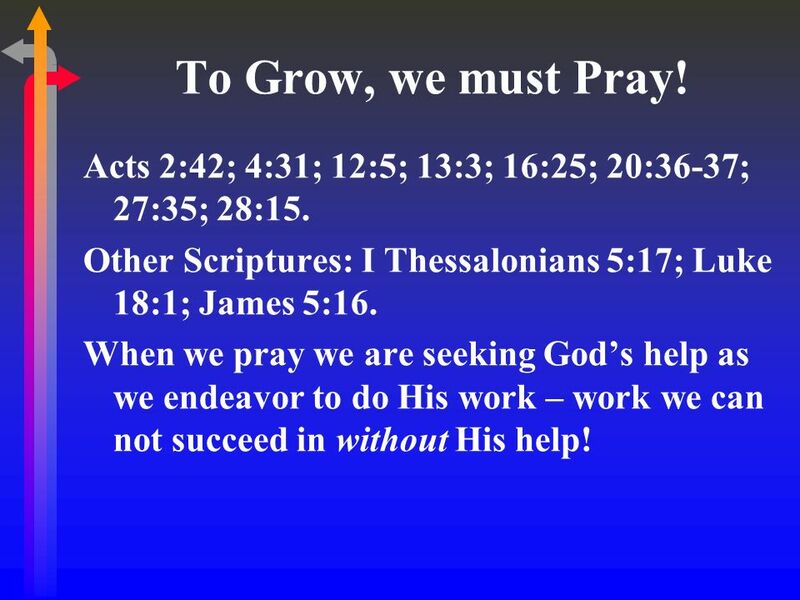 When we pray we are seeking Gods help as we endeavor to do His work – work we can not succeed in without His help! 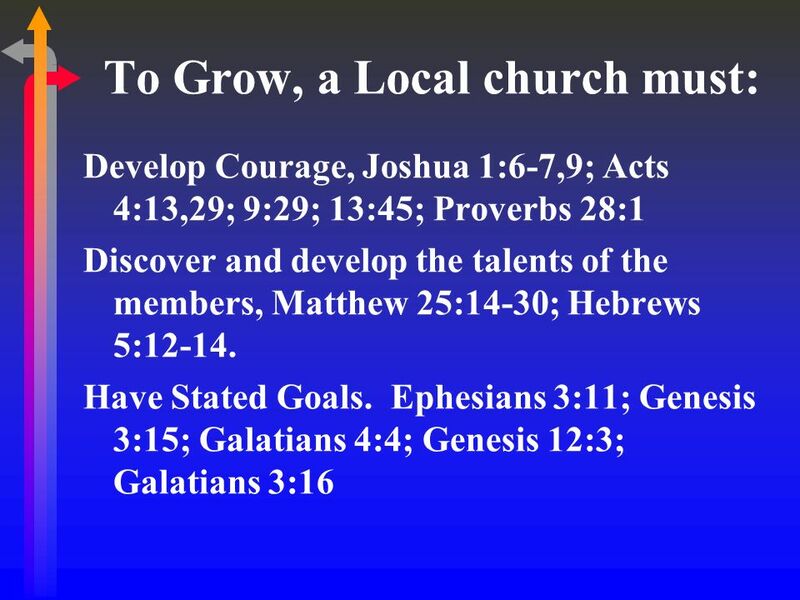 14 Why Do we want the church to Grow? 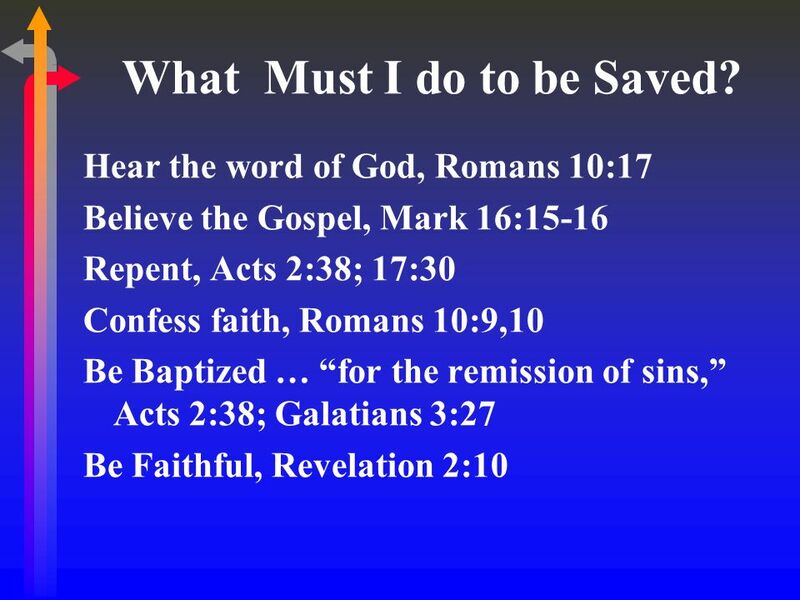 The church constitutes the saved, Acts 2:47. The church is the body of the reconciled, Ephesians 2:16. 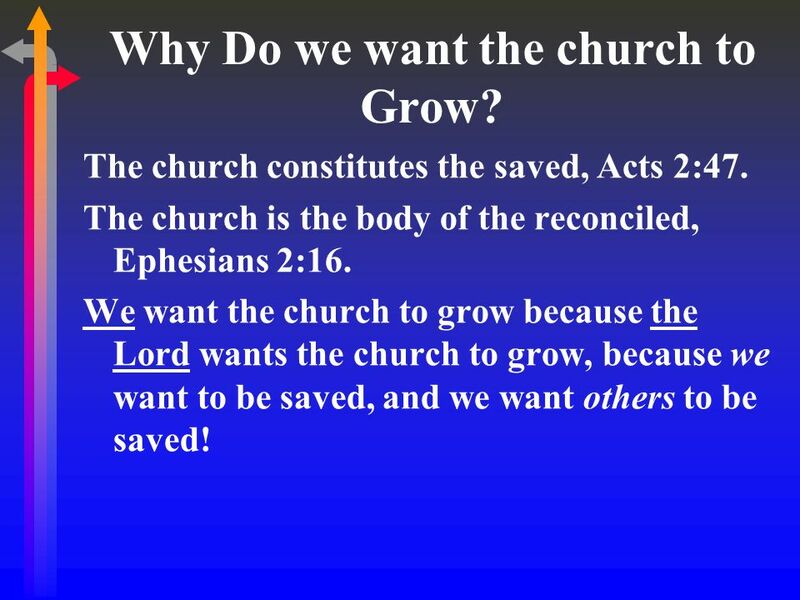 We want the church to grow because the Lord wants the church to grow, because we want to be saved, and we want others to be saved! 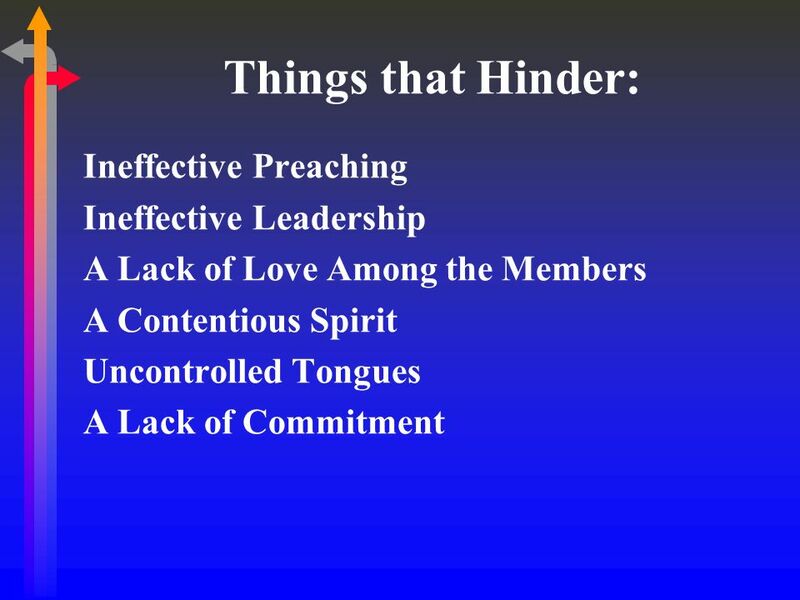 Download ppt "Things that Hinder: Ineffective Preaching Ineffective Leadership A Lack of Love Among the Members A Contentious Spirit Uncontrolled Tongues A Lack of Commitment." The Christian And Challenges In A Modern World The Bible and Modern Attacks Against the Home. The Bible and Personal Godliness and Righteousness. The Bible. I DENTIFYING THE L ORD S C HURCH G OSPEL P REACHING A N A CT OF W ORSHIP.